This photo was taken shortly after 7:00pm on May 6th, 2011 when I got off the bus. 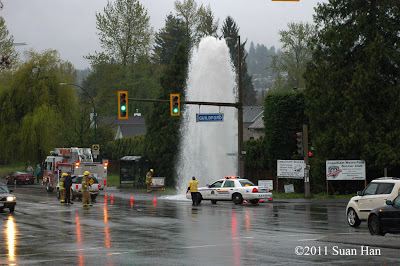 The fire hydrant was knocked off and unleashed geyser as high as the lamp post. I never seen such a big & tall geyser. It's just spectacular! The red hydrant was laying next to the bench off the bus stop while a fire fighter was looking at it. See local news here. Taken with my daily carrying Nikon D70s and Nikkor AF-S DX 18-135mm f3.5-5.6G. Aperture priority, f5.6, 1/125s, Spot metering, +1EV, adding D-lighting later with Nikon Capture NX2.